The State Commission on Judicial Performance recommends by a vote of 9 to 1 that Justice Alex J. Martinez BE RETAINED. 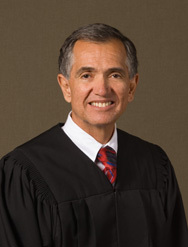 Justice Martinez was appointed to the Colorado Supreme Court in 1996. He is a graduate of the University of Colorado and the University of Colorado School of Law. Justice Martinez has been involved with many community service activities and organizations, including services for primary, secondary and college students, social service organizations, and the arts. He has served as the Chair of the Public Access to Electronic Information Committee (which computerized court filings) and the Child Welfare Appeals Committee. He has also served on the Criminal Rules Committee and the Criminal Jury Instruction Committee. He is a former Vice President of the Colorado Bar Association and served on the Executive Council of the Pueblo Bar Association. He also has served on the board of directors for the University of Colorado Law School Alumni and Servicios De La Raza, a non-profit provider of counseling and treatment services. Prior to his appointment to the Supreme Court, Justice Martinez was a District Court Judge for the Tenth Judicial District, Pueblo County, 1988-1996, and a County Court Judge in Pueblo County, 1983-1988. He served as a Deputy State Public Defender in Pueblo and Denver for six years before his appointment to the bench. Attorneys who responded to survey questions indicate that, compared to the other justices, Justice Martinez's performance is somewhat stronger in the areas of being courteous towards attorneys, being fair and impartial, and issuing opinions in a timely manner. They indicate Justice Martinez's performance is somewhat weaker in the area of writing opinions that are clear and that adequately explain the basis of the Court's decision. Many attorneys commented that he is smart and concerned about each side of a legal argument. However, some attorneys also commented that he writes opinions that are too long and occasionally confusing. Some district court judges made similar comments. The Commission reviewed a number of opinions written by Justice Martinez and found them to demonstrate knowledge of the law and adequate legal reasoning. His opinions reflect a conscientious approach to explaining the basis of the Court's decision. At times, however, his opinions can be unnecessarily lengthy and could be improved by a more concise and pointed legal analysis. Justice Martinez's judicial demeanor reflects fairness and respect to all parties.